The Dual Action Outdoorsman holster is great for field carry whether hunting or for peace of mind in bear country. The DAO can be worn strong side or crossdraw at the user's discretion. 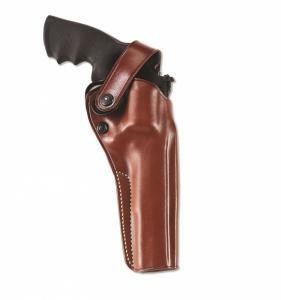 The holster employs a retention strap for simplicity and security in the brush. The retention strap has a large polymer tab to aid in snapping and unsnapping with a gloved hand. Tension screw adjustments allow for a custom fit to your revolver. Constructed of premium saddle leather, the DAO fits belts up to 1 3/4". Made for double-action revolvers, the Dual Action Outdoorsman is available in right and left hand designs in tan.